It’s been nearly 7 years since Street Fighter IV revived the Fighting game genre and while we haven’t hit 1990’s levels of oversaturation, there are certainly more games available now than one person can master. There’s been a particular surge in “anime fighters” – known just as much for their fast and crazy gameplay as their art style – to the point where it’s getting hard to tell the Arcana Hearts apart from the Aquapazzas. So here we are in 2015 and needless to say it takes more than a colorful cast of characters and some flashy super moves for a new fighting game series to grab your attention. 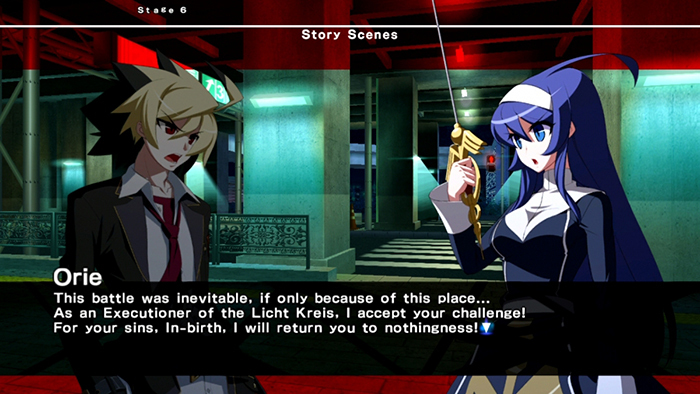 As the latest from former doujin developers French Bread, Under Night In-Birth Exe:Late certainly has those two elements, but does it do enough to stand out from the crowd? Is it better than its incredibly long and awkward title lets on? Can I get through this entire review without saying “Melty Blood”? Let’s have a closer look. During the “Hollow Night” that occurs during the full moon, certain individuals are transformed into “In-Births” and receive special powers. Several organizations are seeking to use the power of the Hollow Night for their own purposes. That’s about as much as I was able to understand as most of the game’s story is told entirely with dense, incomprenensible, fantasy technobabble. The characters themselves have slightly more interesting, personal stories but mostly fall into anime clichés. Hyde is the regular dude that’s angry he got dragged into this but all the ladies love him, Linne is the youthful looking immortal who seeks the peace of death, Orie is the well meaning but lawfully stupid inquisitor – the list goes on and on. Fortunately the story doesn’t play as much of a role as other anime fighters like Blazblue or the Persona Arena games. In fact there is no dedicated story mode, just good ol’ fashioned arcade mode cut scenes. Granted these scenes are a bit more lengthy than your average arcade mode, but there’s no hours of visual novel style dialogue to slog through. It also helps that the game’s self aware sense of humor never demands that you take it too seriously, as if the authors realize how ridiculous they must sound sometimes. I should hope that no one is primarily playing even the most story focused fighting games for the plot, but if you are this might not be the game for you. The nuts and bolts mechanics are always the most important part of a fighting game and this is the area where UNIEL really shines. With a stronger emphasis on normal attacks and limitations on moving and blocking in the air, some people have been calling it “The Street Fighter of Anime Fighters”. I wouldn’t say that’s the most accurate comparison as it is still fast and combo focused, but it’s an OK place to start. You have your basic super meter which fuels your special moves and allows you to enter “Veil Off” mode, giving you a temporary power boost similar to other fighting games. 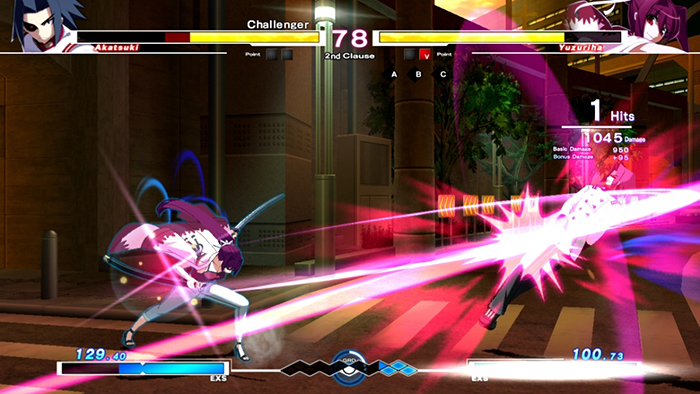 What makes UNIEL truly unique though is the “Grind Grid” system or GRD for short, which is so complicated that I’ve been debating how in-depth I wanted to get into it for this review. It’s so intergral to the unique feel of the game that I do feel it’s worth taking the time to go over the details. You’ll notice the GRD meter and a circle timer located at the bottom center of the screen. Each fighter builds GRD by playing aggressive and using smart defense. That means advancing toward your opponent, landing hits, and successfully blocking. On the flip side you lose GRD if you run away or take a beating. Every time the circle timer completes, the player with the most GRD at that moment is rewarded by entering “Vorpal State”. While in Vorpal State you can continue as is and deal more damage, or you can trigger a special move cancel for extending combos or saving yourself from getting punished. Going the cancel route will end Vorpal State immediately, but you will also receive a super meter boost based on how much GRD you gained. In the right hands, that’s enough value to dictate the outcome of the entire match. It sounds very complicated and it is, but in practice it works surprisingly smooth. As a nice visual cue your fighter will glow with blue energy during Vorpal State, so if you play well and know your options you don’t really have to think about it too hard. It also helps that inputs are forgiving and all of the special moves have very basic command inputs, leaving your brain free to focus on strategy instead of strict memorization and execution. Overall the gameplay is very easy to learn with enough depth to be satisfying as you master it, and that’s about all you can ask for from a fighting game. 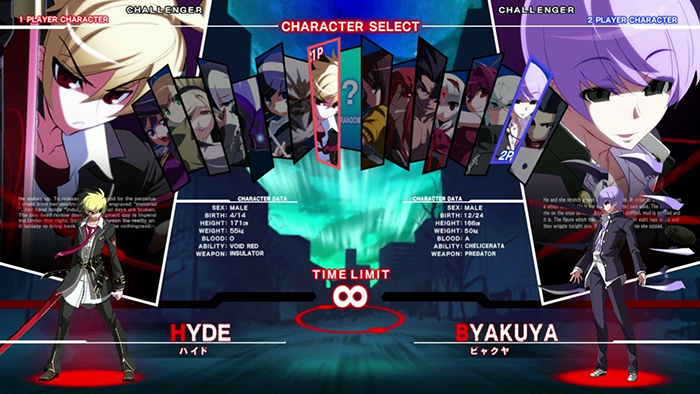 In terms of game modes UNIEL has all the basics covered including Arcade, Time Attack, Survival, Training, and of course, Versus. There’s also a Gallery mode to collect artwork, Customize mode that lets you pimp out your title card and unlock alternate colors, and the ability to watch and save replays. The only thing missing is a tutorial, which given the complexity of the GRD system is sorely needed for the core mechanics. Maybe I’m getting lazy but having to read a manual and look things up online in 2015 seems really tedious. There’s also the option to play friendly or ranked matches online and unfortunately I was a little disappointed with the game’s performance. Even when playing with one of my friends who lives less than 5 miles away, I was experiencing notable lag during portions of most matches. I’ve played other, faster fighting games online nearly lag free in the past, so hopefully that is something that can get patched up in the future. 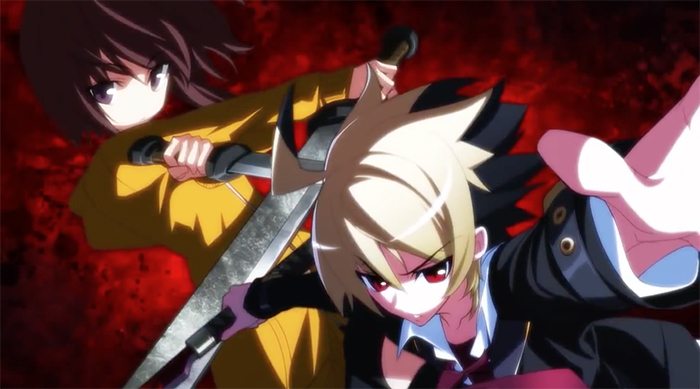 As noted in the story section, UNIEL is so “anime” it hurts and that extends to the audio/visual presentation. The character designs look like they could have been pulled from any recent urban fantasy light novel series, the soundtrack is not particularly notable, and for better or worse the dialogue is all Japanese with no dub track option. The graphic designer in me was particularly disappointed with the menus as they look incredibly amateurish. In fact, “amateurish” might the best word to describe the overall presentation. Outside of the gameplay itself it kind of feels like an indie game trying to emulate the Big Boys, and I suppose given French Bread’s pedigree that might not be too far from the truth. 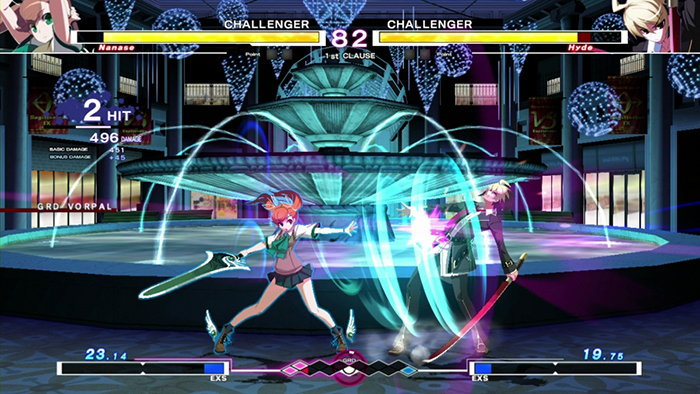 Fortunately when it comes time to fight, UNIEL looks awesome with some great animation and solid special effects. I particularly love how the biggest super moves invoke a giant, fully animated portrait of your character which the more I think about it makes no sense whatsoever… but it sure does look cool. The special moves themselves are appropriately flashy, and if you’re like me and you play fighting games solely to get the big super moves and humiliate your friends, you will not be disappointed. 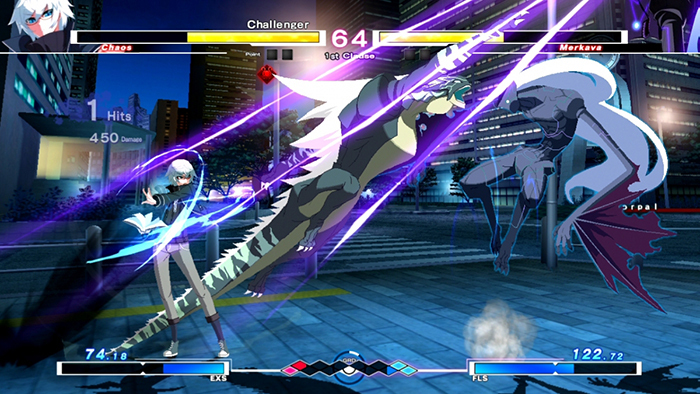 UNIEL lacks some of the comforts that other modern fighting games provide, but it has everything you need to enjoy its most important feature – the fighting itself. With 16 unique characters to learn, art and alt colors to unlock, and very satisfying gameplay mechanics that are simple to learn and tough to master, UNIEL earns its keep as a worthy contender in the crowded genre. If you’re like me and you’re too fiscally reasonable to spring for Guilty Gear Xrd on PS4, this might be your next best option for a fresh Fighting Game fix.